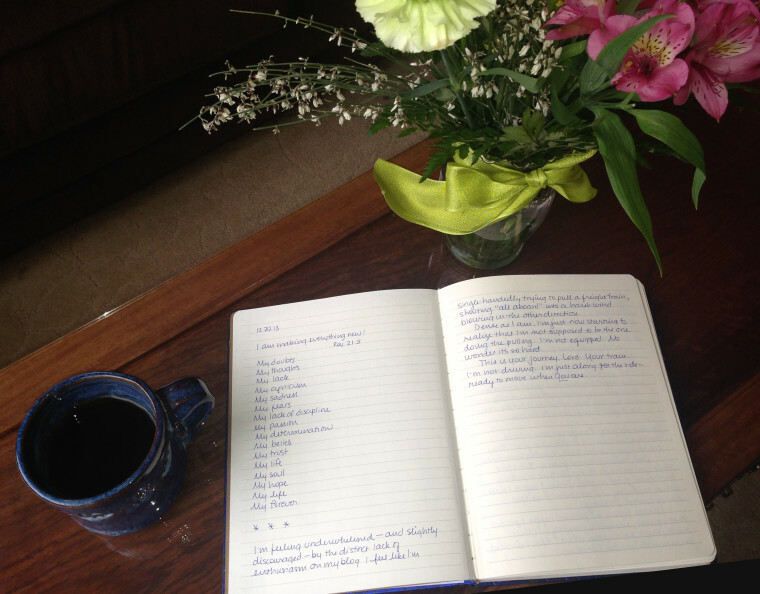 Keeping a prayer journal can be a lovely spiritual practice. A record of your faith journey. A chronicle of your growth. For years, I’ve prayed many of the same prayers. Help me to learn [fill in the blank]. Remind me to notice. Let me get out of the way and put You first. Help me remember this book is about You and not me. As you’ve all witnessed, I’ve been struggling with reconciling the numbers side of the equation as I head towards my publication date. I’ve had such big revelations and fresh insights. I feel like a huge weight has fallen off of me. I’m feeling overwhelmed—and slightly discouraged—by the distinct lack of enthusiasm on my blog. I feel like I’m single-handedly trying to pull a freight train, shouting “all aboard” into a harsh wind blowing in the other direction. Dense as I am, I’m just now starting to realize that I’m not supposed to be the one doing the pulling. I’m not equipped. No wonder it’s so hard. This is Your journey, Lord. Your train. I’m not driving. I’m just along for the ride—ready to move when You are. Now, I promised to stop talking about numbers. This topic seems related, but really that part is tangential. It’s not about that anymore. Instead, I’m talking about being a slow learner. About moments of receiving divine insight. Being freed from burdens I shouldn’t carry. Casting all my cares at God’s feet… and then turning around and picking them up again. Praising God for what He has revealed. And then forgetting two days later. How can I be so dense? What is wrong with me that I can’t keep my eyes fixed on Him? That I fail over and over—in the same areas, with the same lessons, praying and pleading for the same things He’s already addressed with me? Please tell me I’m not alone. Maybe I am, but somehow I think it’s an issue we all fight. Because this journey of faith isn’t short, a sprint—no, it’s a long, long road. Or at least we want it to be. We have lots of time to learn. And, quite possibly, to forget and learn the same lesson all over again. Maybe even five or ten times. Sad but true. Your issues may not be the same as mine. But is there one prayer, one change, one thing you just can’t seem to get past? Can’t stop praying about? Maybe it’s time to learn what He’s trying to teach us. Pray with me? Lord, my memory is so short. Yours isn’t. How you must groan and shake Your head when we come to You, again and again, with the same words, the exact requests repeated over and over. Please forgive me. Please fix whatever it is in my soul, spirit, mind and heart that keeps me from learning, that gets in the way of remembering. Maybe sometimes You want to scream in frustration. But deep in my soul, I feel certain that You love me. That You forgive me. That You want me to try again. And that You will not give up on me. You will keep teaching, keep showing, keep restoring and renewing and revealing—as long as it takes. With infinite patience and remarkable grace. I can barely grasp the enormity of Your mercy. But I want to do better. I want to get past this barrier in my faith and move on to the next thing. I want to be refined. I want to change. I want more of You and less of me. I want to see You and know You and reflect You. Help me, sweet Lord, to walk past this stumbling block on this road I am walking with You. And thank You, from the deepest depths of my soul, for being willing to walk alongside me. Even when I mess up. Even when I forget. Even when I stumble over the same bump in the road more times than I can count. You are amazing. And I love You.